The (same old) story goes on like this. I am surfing on the Internet. I check to see what is there at Ichibankao. As soon I am at the website, my eyes instantaneously focus on a palette with purple. You can guess what happens after that, *click* *click* *CC Card* *click*. And here we are today with Addiction's Holiday clutch, Tokyo Jazz Set. Tokyo Jazz Set includes a clutch in artificial leather but it feels rather plastic. Inside there is a zipper which is great if you want to put small things inside, like make-up, so nothing drops. I can't think myself using this to go out or something but it makes a super cute make-up bag, so I am happy with this offering. Inside there is a palette with four eye shadows and an eye liner. Eye liner is full sized and is a part of their permanent collection. It is called Eyeliner Pencil in Black Jack. 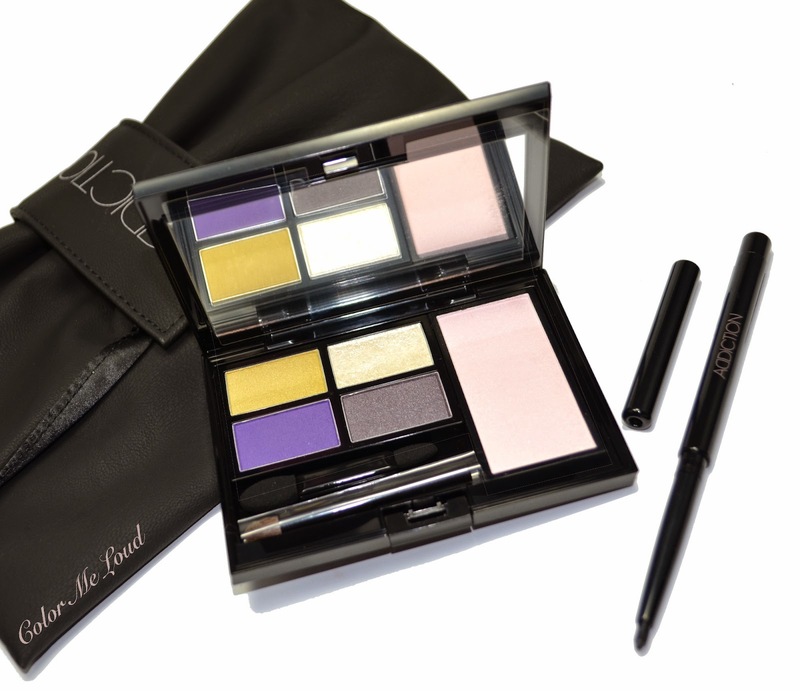 The highlighter at the right of the palette is a very light champagne with shimmer and glitter. I applied it on the top of my cheek bones but it looked like I had fall out from the eye shadow. Maybe it was the fall out from the eye shadow? No one can tell. All I can say is that it is the least favorite product from the set. 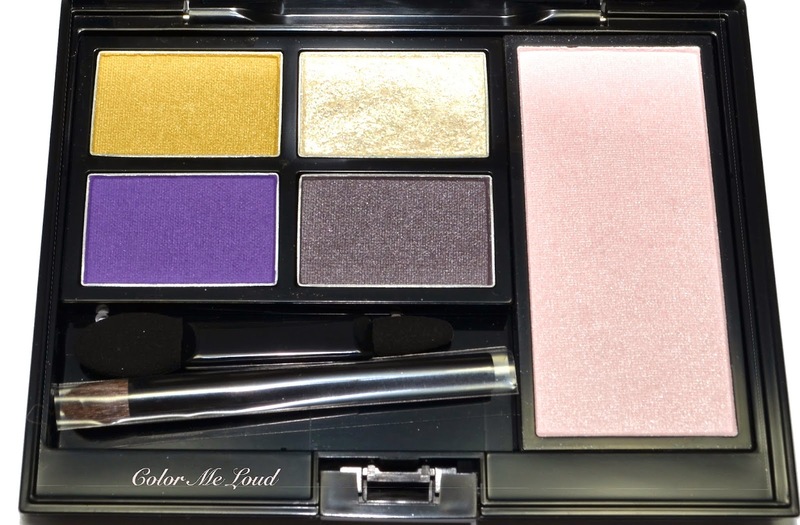 The color story of the eye shadows remind me of Soda Lunch. You can see gorgeous swatches of that one here at Belly's blog. She shows how nice the subtle shimmer in Soda Lunch is. Tokyo Lunch, ehm sorry Tokyo Jazz lacks this complexity. 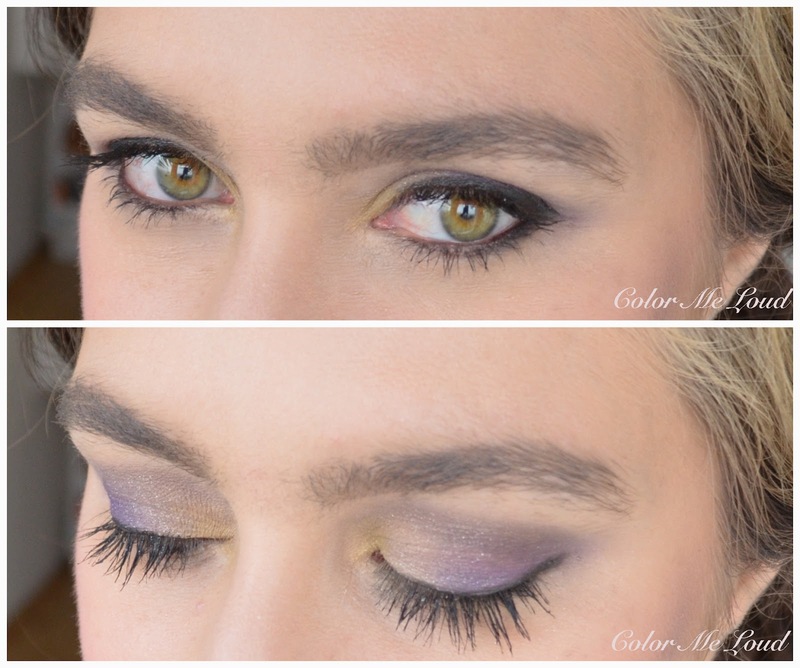 Two of the shadows, yellow and purple are flat mattes. They are a little drier in texture, which doesn't bother me at all. They are not as special as the ones from Soda Lunch though. The third shade is gorgeous, it is a deep taupe grey with purple/blue undertones, so gorgeous. And of course there is a glitter shade, which is fine but not really that necessary. The star of the show to my opinion is the black eye liner. It is very soft and so creamy. It applies like a dream and pigmentation is out of this world. I wished it wouldn't be black though, since I rarely wear black eye liner. 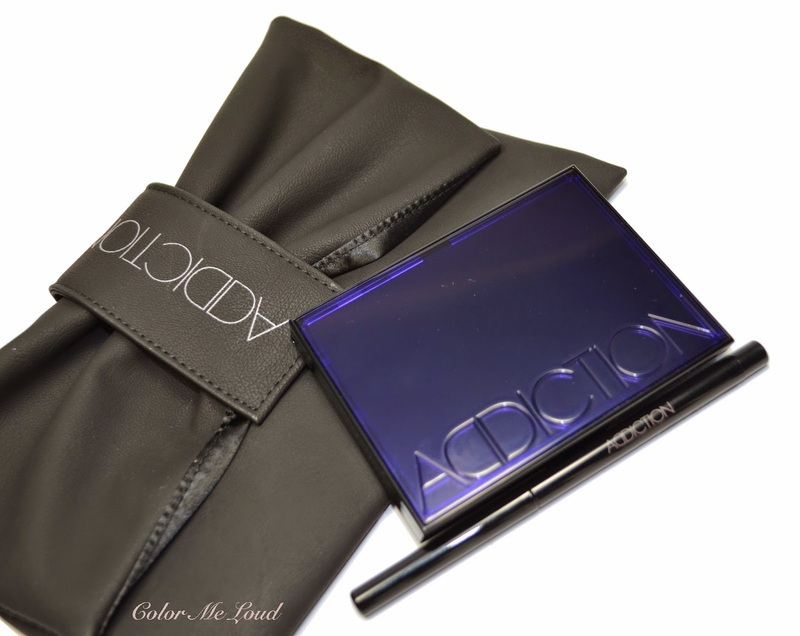 I will surely check out the other shades from Addiction Line-up. Fun time with Tokyo Jazz, I placed the yellow on the inner corner, purple in the outer corner and deep taupe on the crease. I then padded some glitter on top, right amount since this was a "day look". 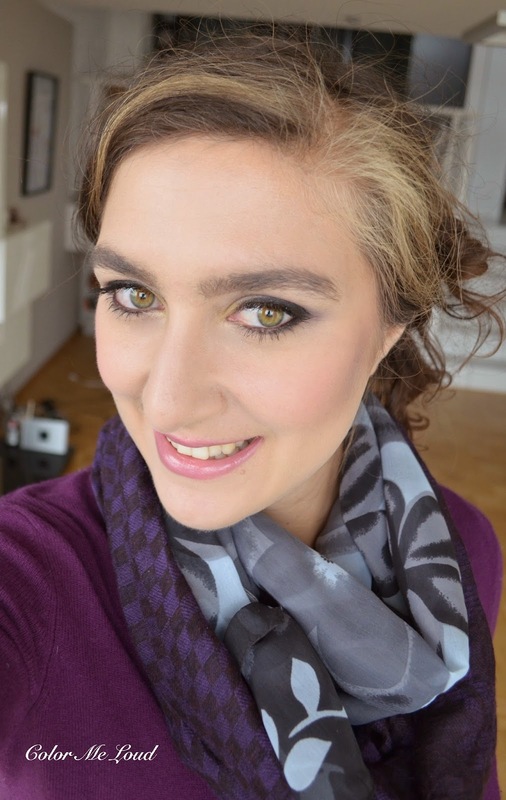 I also lined my eyes with the marvellous black liner and added a bit of glitter on top of my cheek bones. Final thoughts: Addiction's Holiday offer is a good deal with highlighter, four eye shadows and an eye liner. I thought the eye shadows were lacking some complexity and the highlighter was a bit too glittery for my taste. Eye liner is really good though and I like once they are applied all together. Hey Sara, oh I know that story :p My last impulse buy was a brow pencil and tinted brow gel from Anastasia! I like the palette on you, but it's probably not for me. I think I'll find both the purple and the yellow tricky on my skin tone, and the highlighter seems a little... too shimmery in the swatch! LOL Sunny, I know you can understand me. I hope you like the brow set from Anastasia. Have you tried Armani's, their shades seem to be nice too. Yes highligher is nothing I would get alone if it wouldn't be included. 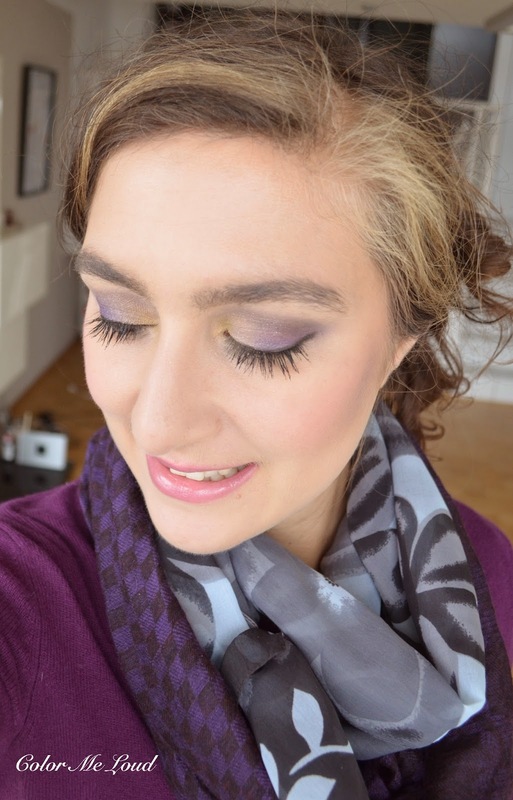 Love this look on you-- you can really wear purple. Thanks Alison, purple is my favorite shade! I was considering this one-but quite happy now that our postal system has been 'on Strike' for 4 months so I cannot order from places that rely on the postal system --it seems like a lackluster palette. Soda Lunch looks far too similar and much better all round!! I think you were rather lucky that you couldn't order it. This type of shades are easy to find and yes luster and complexity is lacking, and highlighter is way too shimmery. You are right, I am not impressed either. Too bad, the idea is great but the result is so so. Oh I always wanted to check out Illamasqua Fundamental. It is certainly a fun palette too! Hi Sara, it actually looks very good on you! I missed Soda Lunch, because some gals were supposed to pick it up for me from Japan but didn't. I tried this out last week, and i actually kinda like it! Let me play with it a bit more and see! Soda Lunch was an epic release and I missed on that. Afterwards I picked it up at a blog sale, yes I turned super duper lucky lol. I am glad that you like this one, I find it a bit flat. What do you think about the highlighter?